I have no clue what kind of spider this is. He just bummed a ride on my windsheild one day. If you know, please leave a comment and tell me. copyright 2002-2011, Emily S. Neel Email emily@pbase.com for permission to use this image. I saw the same spider in Queensland Australia, my hometown, I was a little discombobulated when I saw this spider, as I never saw a spider like this with long arms. This family of small spiders (most are merely 2 to 4 mm long) is also known as Cribellate Spiders or Mesh-webbed Spiders. Many species are attractively coloured and showing distinctive patterns on the bodies. Identifyication is often possible although in some cases you won't be able to determine only the genus. They build a small, robust web, usually on leaves and wait under it for their prey. For animals as small as these spiders, the prey is can be surprisingly big. The females are exceptionally gentle with the males. After mating they often live together for a couple of weeks, until he dies. Only then she will eat him although there are exceptions to this rule. The green species below is easily identified. The animal in the picture is a male. The female has a light green thorax. The markings on the abdomen differ clearly from those on the abdomen of other green species, such as the Cucumber Spider and Diaea dorsata, a Crab Spider. The web is usually build on big leaves. In spite of the striking colour this spider is rarely spotted. In the Benelux area this is a common species. In England it is a rather local species which can be found in London among other places. We cought one today, I put it in a jar with a smaller spider. All it did when the little spider got closer was tapped it a few hard times and the little one just went about its way webbing. They have been in the same baby food jar for a few hrs. And have not eaten eachother yet. I too am curious about what type of spider this is. It is interesting how it moves its front 2 legs, and resembles a grasshopper's head kind of. I had one come out of my nose and i am beyond terrified of spider so i freaked out then when i say it again i squashed it real good!!!!!! This was by far the coolest spider i have ever seen in person! I found him on a huge rock by a lake in Ohio. He was very calm and i let him crawl on me for about a half hour while i watched his movements. I even saw him shoot a few webs, something i'd only seen on television in slow motion until then. Nature is the coolest, who needs tv. It's amazing how calm other life forms are when we're not freaking out and screaming. just found one in my kitchen hanging from the roof. i was very curious about what it is so i took my broom and knocked it down. it tried to run so i wacked it a little just to stop it but now its lost somewhere in my broom and i dont think i wanna stick my hand through to find a spider that i dont even know about. i just got biten by a little green spider it was as if a bug bit me i hpe they not pisonas :/ ill let u know if ne thing eventuates from the bitefingers crossed it dont!!! About a month ago i got bitten by one on my right hand. As soon as it bit me a blister devoloped. I applied antibotic and left it along. It took two weeks for the blister to dry up. It did however left a brown spot. No, they are not poisioness. Found one on my driverside door this afternoon... (spiders seem to like bumming rides apparently).. but i got in through my passenger side door and drove home with it.. LOL...and had the neighborhood kids take it off my car for me cause helllllll no am I gonna go near that thing.....Live in south Florida.. I just found one of these on my counter. Its soooooo little, but I thought it was cool since I've never seen one that color. It was like kelly green! I just found one on the side of my car next to my gas tank. Freaked me out...but glad to hear it's not dangerous. I live in Central Illinois. does this spider jump too i got bit by a little green spider and i have redness and swelling around the bite mark just itching when i first got bit.i feel like crap all i wanna do is sleep i have a bad headache im not really hungry if i am at all.is this spider poisionus can somebody help please!!! i found one outside today at my backyard.i got scard andran but fell and got hurt .so my mom got me in thank you for telling me it is hamless also it jumps. Go to bugguide.net and search under "crab spider" or "flower spider". You can submit a photo too, under ID Request. It's free. Anytime you see an insect or spider and you don't know about it, go to bugguide.net. The site is run by Iowa State University Dept. of Entomology. If you want to feel REALLY creepy, take a look a House Centipedes! You'll learn to be kind to them as they are VERY beneficial. Some fun comments on them are there too. yeah I found a bright green one on the playground today..I hate spiders so I ran away, but I'm sure its fine.. Thank you for posting this. I had one in my kitchen this morning, and even though it's small, it still freaked me out! I've never seen anything like it. I'm in the Detroit area. What Kind of spider lives in Sunflowers? Because I took a sunflower in a patch next to where I work, and later I felt something crawling on me. I saw a small spiser the size of nickel and baby spiders coming out of it. It was yellow-ish. Please help! I have bites all over me and I don't know what it is! good to know what kind it is. my dad just got bit by one and he says it burns!!!! We found one today on the wall of our pub over in Lee, North Devon UK. Had it in our hands and had no bite or anything from it. But it did take up a position that it would atack when we came to close with our fingers. The crab spider - like all spiders - is in fact venomous, but as pointed out, is considered not harmful to humans. what kind of spider is this! ?is it poisioness? I just found one hanging on me by its web. It was very disturbing. 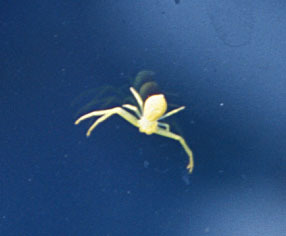 The spider in the photo is a crab spider and is comonly known as the neon flower spider. No they are not poisionous, and if you do happen to get bitten witch is highly doubtful, the only thing you will experience is a red bump that itches like a mosquito bite but most likley if bitten nothing will happen and you will be fine there is no need in medical attention. All crab spiders are non-poisionous. They may look exotic but they are harmless to humans. Crab spiders don't use webs so they can be found anywhere to attack there next victom, I usually see them on flowers sitting motionless, on car windshields while stopped at a red light, in my bathroom, and just about anywhere else a spider can go. Crab spiders are generally shy and can be quick at times but I like to hold them in the palm of my hand so I can get a close up view of them and also feel how they move from my hand to my arm. You can hold a crab spider if you are carefull with it and don't freak out because of it's looks and it's movements I can almost garuntee you will not get bitten and if you do it is painless and harmless so feel free to study and learn more about the harmless crab spiders in our back yards and sometimes in our homes. i work at a daycare and i found one outside. it's color is almost transparent and the markings on it's back look almost like a face. i would really like to know what type of spider this is. I GOT BITTEN BY ONE OF THESE SPIDER.IS IT POISIONESS? DO I HAVE TO SEE A DOC? i got one on my lavender plant in Sydney Australia. isn't it a cool little spider! thanks for putting the photo on-line! The spider in the photo above is definitely a crab spider. They are harmless to humans. Mine was huge- maybe 3 inches across if legs were spread out. On the outside of my window in a web- there one minute, gone the next. My 8 year wanted daddy to catch it- he wouldn't go near it! We are in Denver where it's usually too dry for such wildlife. it looks like a yellow sac spider. i saw on my sunflower a week ago. Looks like a yellow Sac Spider. Watch out for these if they are Sac Spiders, you do not want to get bitten. Yellow Sac Spiders are relatively small (10 mm body length), and are yellowish in color; they are difficult to distinguish from one another. Bites generally produce instant, intense stinging pain, not unlike that of the sting of a wasp or hornet. This may be followed by localised redness, swelling and itching; these manifestations may or may not evolve into a necrotic lesion, but when that occurs healing is usually complete within eight weeks. Side effects may include chills, fever, headache, dizziness, nausea, anorexia, and sometimes shock. I just found one tonight on my umbrella on my patio table. We live in Northern Illinois, but recently took a vacation to virginia. What is this? Is it poisonous? i found one on the bottom of of a plant that a squirrel dug up out of my garden do does anyone know what kind it is? Ya... It was on a flower I was picking. Is it poisioness? What kind of spider is this!? I just found one hanging in my room, is it poisioness?